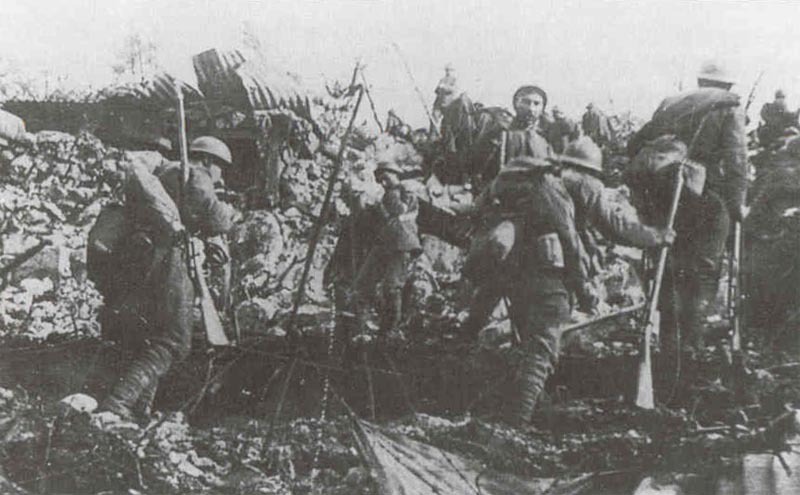 Italian infantry during an assault on the Carso plateau. Italian Front – Seventh Battle of Isonzo (until September 17): Alter lengthy artillery preparation including gas shells Italian Third Army (14 divisions, 966 guns, 584 mortars) attacks at 0900 hours on 6­-mile front, captures Nova Vas Hills 144, 265 and 208 (Carso) with 1,800 PoWs, later regained by Austrians (Fifth Army, 101 battalions with 409 guns). Macedonia: Italians and French make diversionary attacks in Doiran­-Vardar sector. Serbs break through at Gornichevo on Florina road and capture 32 Bulgar guns. Battle of the Somme: British storm trenches southeast of Thiepval and 11th Div the ‘Wonderwork’. Haig and Rawlinson confer, Haig urges determined assault on Martinpuich. French I Corps captures Le Priez Farm; French XXIII and VII Corps both stalemated; 78 German counter-attacks since September 1. Transylvania – Battle of Merisor-Petrosani (until September 22) north of Vulcan Pass: Rumanian First Army attacks towards Hatszeg. Austrian codebreakers get a warning of Rumanian counter­-attack.